Trump’s biographers have called him someone who was convinced of his own ability to manage and fix anything. As a candidate for US President the sense of being able to resolve problems served him well. He readily trumpeted statistics to suggest the ease with which a range of otherwise intractable problems could be solved in an almost common sense manner that endeared him to populist following, and inflected his false populist claims. Trump gained a wide flowing by directly questioning statistical declines in urban crime over decades as concealing an actual rise in criminality during the Presidential campaign, which he linked to Obama’s “rollback of criminal enforcement,” to the consternation of commentators; querying the importance of regulations on fossil fuel industries; insisting on the need to build clear boundaries and expel immigrants to better the place of American workers; questioning the relevance of science and indeed the statistical basis of regulations imposed by or developed by the EPA and USDA to safeguard the environment or human safety. To orchestrate such dismissive attacks, Trump has in the past regularly doubted the official numbers, and suggested that they were “rigged” for reasons he never asked his audience to consider with an astounding abandon. Trump has dismissed “phony” government statistics about unemployment numbers, dismissed Congressional Budget Office predictions, as well as calling into question the office, and boosted false numbers of pro-Trump crowds or indeed chosen outlier Rasmussen polls to inflate his approval rating. Is not what Trump champions as data often discredited itself? Trump’s sense of self and of his own abilities may hide a deep cognitive barrier to processing the multiple causes of climate change, as if to assert a populist basis for rejecting established observations, creating a tempting if dangerous line of thought. 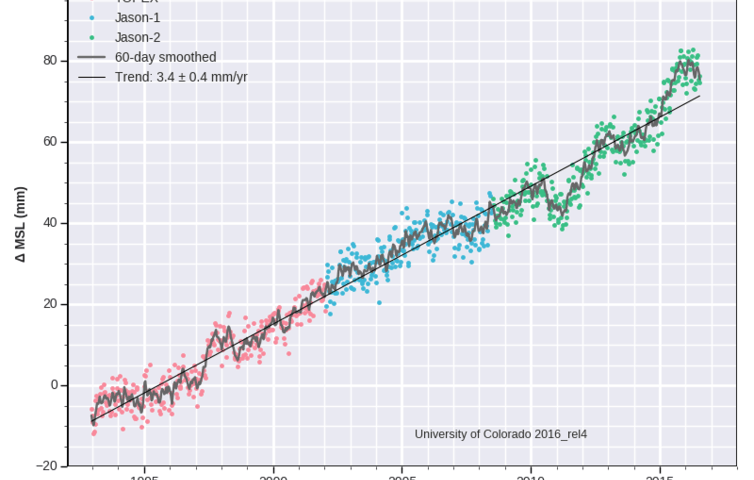 The disdain of numbers’ validity, and a deep confusion between data confirming an argument and data that exists to be massaged comes to a head around issues of global warming. and As Bill Nye put it after Trump’s inauguration, in struggling with a “world-view that disagrees with what you observe,” Trump seems compelled to search for data that might support conclusions at variance with observed science, creating a toxic and dangerous marriage of populism and the discrediting of scientific observations and expertise. Is this the consequence of national innumeracy, or the somewhat Faustian obsessive assertion of individual abilities? 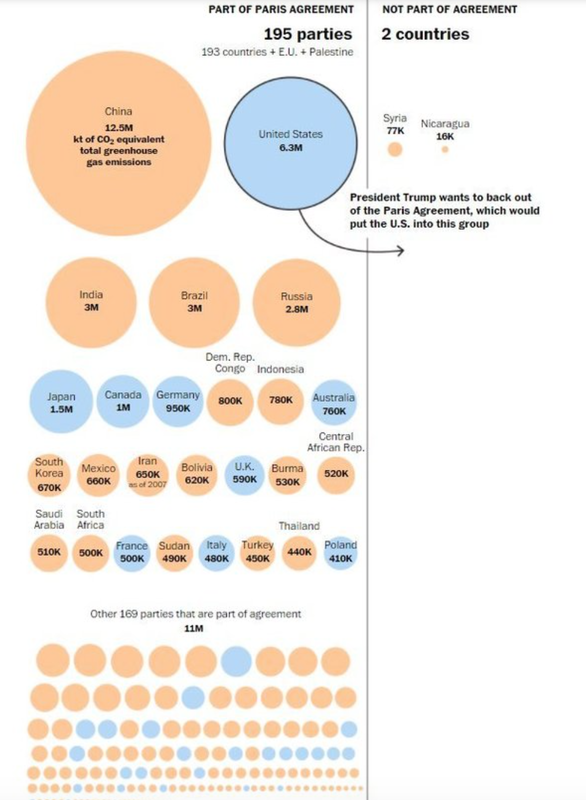 Trump’s focus on individual places to attempt to rationalize his withdrawal from the long-negotiated Paris Climate Accords, rather than on the global entirety of climate change, achieved an unprecedentedly parochial warping of a global concern to obscures the dangers of climate change and shift attention from measurement of its real mechanics or the potential dangers that necessitate collective action. Strategies of climate change denial long championed the local to the exclusion of the global–so much that Putin pivoted his supposed support for climate change initiatives when he queried the liability of climate change– “Climate change brings in more favorable conditions and improves the economic potential of this region“–when he responded in the logic of a purely local perspective. For Trump, ready to champion himself as being elected to represent Pittsburgh rather than Paris, loyalty to voters in Pittsburgh, PA–even if they did not vote for Trump–offered a synecdoche for the assistance he promised to jobs in the nation’s rust belt, as if to make good on his promise to keep his priorities at bringing back jobs, manufacturing, and economic vibrancy. 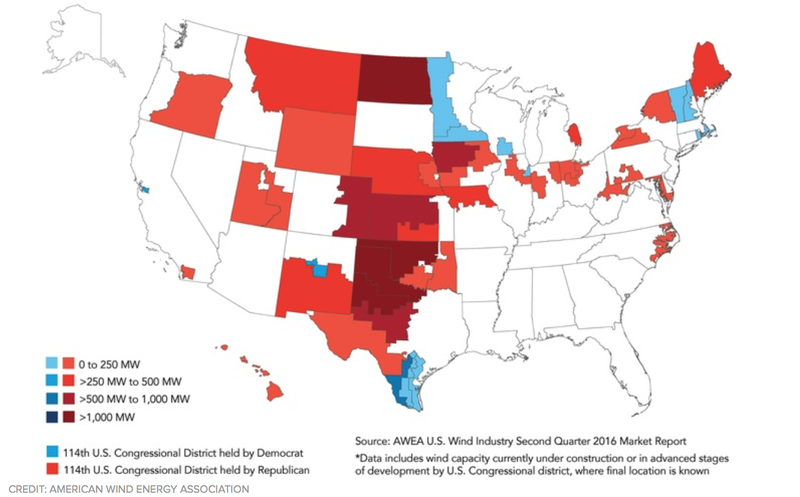 Indeed, the growth of clean energy jobs on which Trump turned his back lies precisely in the American “heartland”–which he had so often evoked on the campaign trail, in ways that suggest that he was primarily using fossil fuel industry tools and the misleading data by which fossil fuels companies have long used to distract attention form the dangers of global warming, and the support for wind energy that exists across states that tend both Democratic and Republican, as wind manufacturing plays a significant role in the economies of states from Michigan to India to Virginia to Kansas to Iowa to Texas to Oklahoma to New Mexico–but will be effectively sold out to fossil fuel energy interests, at significant cost to the nation. This is not so surprising from a President who three years ago boasted that “Many people have said I’m the world’s greatest writer of 140 character sentences.” There is something deeply jarring of a man who can champion the virtue of entertaining an “American” perspective on an issue of global consequence. Pope Francis, by tradition invested with a truly global purview of Christian leadership, openly hoped before the withdrawal of the United States from the Paris Accords, for needed global consensus about an issue he had cast in the encyclical “Praise Be” an urgent “moral obligation” for the world, before Trump’s withdrawal from the Paris Accords: for Francis had forcefully expressed a collective need to challenge what he woefully described as the “perverse” models of economic development that enriched the wealthy at the expense of the poor and transformed the glory of God’s created world into an “immense pile of filth.” Trump’s championing of the local played on the sense of a group of Americans that globalization had indeed duped them, and that global warming was but an excuse for changing the economy that ripped the rug out from underneath their feet. But were there real reasons for rejecting the treaty described in the Rose Garden, or so dismissively cast in all caps as “BAD”? And if it was bad for Americans, can one really promote that single perspective, and not a transcendent perspective, allowed the best way to comprehend the undeniably global scale of rising sea-levels and warmer temperatures? For Trump’s tone was one of bullying, and his message was of intransigent resistance more than informed skepticism. Trump dismissed the data about global warming as fraudulent in ways that lacked compelling concrete support. In fact, his citation of statistics that seemed to undermine the treaty was both particularly disorienting. Trump implied data documenting climate change was both deceptive in ways that were particularly disadvantageous to the nation, and rigged results against the needs of Americans so keenly that “leaving Paris” was the only fit response. Trump took the news conference in the Rose Garden as an occasion to trash the treaty Kerry and Obama concluded overseas as a deep betrayal of national interests, a scam into which his predecessor was duped by alien global interests. In so doing, he seemed to affirm the deep populism of his Presidential agenda that his predecessor lacked, but in a manner that smelled of Willy Loman’s refusal to ever deign to educate his electorate in ways Obama must have been deeply shocked and alarmed. Trump affirmed with derision that even if its obligations were fulfilled, as well as imposing restrictions that singled out American workers, with the exaggerated explanation that they would only result in a net decline of “.2 degrees [Celsius]”, as if to diminish its value, in addition to claiming to effectively swindle the U.S. out of “at least $3 billion.” The now-familiar tendency of Trump to juxtapose unrelated and completely disconnected figures of disarmingly different scale seemed to try to disorient his audience, as well as affirm his own statistical illiteracy. In his stage-managed press conference at the Rose Garden, Trump inhabited a bubble of aggrieved self-importance with great satisfaction. Trump concluded the conference, as if challenging listeners to grasp his logic, he affirmed that he had seen through the Accords he could expose for the world as a shell game unfair to “the United States, its businesses, its workers, its people, its taxpayers,” and affirm his solemn duty to protect America and its citizens, obscuring the decision-making process itself. “So we’re getting out,” the President seemed to affirm conclusively, bringing his comments to a close while smiling at achieving some sense of suspense, smiling with evident satisfaction for applause for this implausible conclusion, and promising to place Americans’ well-being first, the rest of the world be damned. Even when he was discussing events of global importance, he seemed peculiarly at home and in his own bubble, defending the burning of coal and growth of the coal industry, concealing that limits agreed to at Paris were voluntarily self-imposed. While Trump addressed constituents, he must have known he was actually addressing the world on a far greater platform of Reality TV than he had ever known. –was without impunity falsely attributed to “researchers at MIT” who quickly distanced themselves from the cited data as in fact misleading and outdated by several years, and tied to research predating by two years the 2015 Paris Agreement and only accounting for cutting carbon reductions to 2035. The treaty for reducing emissions that 197 nations pledged to work toward would cut the planet’s pace of warming of nearly a full degree celsius (1.8 degrees Fahrenheit, the standard for temperature most widespread in the US) by 2100. But by citing the outdated report as if it were authoritative, Trump used a rhetoric of deception not standard for Presidential news conferences of global significance, if well-known as a strategic tool of debate. Discredited data was something of a leitmotif, however, of a presser that included wildly inflated costs to the country of signing the accords, as if to sweeten a bitter pill. (Not doing anything about climate, the director of MIT’s Joint Program on the Science and Policy of Global Change affirmed, global temperatures might grow over five degrees celsius, beyond the expected rise of 4 degrees in most climate models, with the result of increasing rainfall by 25% in North America and Europe, creating extreme weather events and flooding at almost all latitudes.) The commitment to reduce emissions by a quarter by 2025 was something Trump disdained, in short, out of belief it had negligible impacts on climate. No doubt, President Trump would like to strike as if by a line-item veto, freeing up funds for pet projects like the US-Mexico wall, more tax cuts, and a boosted immigration detention network. Without returning to the famous 2012 tweet that called the very “concept of global warming created by and for the Chinese to make U.S. manufacturing non-competitive,” the self-proclaimed master of twitter used the same logic of a rigged world to withdraw from to Paris, by figures that shifted attention from greenhouse gases, sea-level rise, carbon emissions, ecological responsibility, or global warming to a tally of foregone profits and imposed expenses, treating a problem of fixing the books. Barack Obama had already contributed $1 billion to the Green Energy Fund as President to encourage poorer nations to develop clean energy projects. But The Donald painted future payments as extortions and as constituting a net loss for the nation, imposed atop onerous restrictions for producing and mining coal–in itself perhaps a cover for reducing other fossil fuel energy regulations. 2. Trump dramatically magnified the local “unfairness” as his main justification for removing the nation from the global climate treaty. The focus on the local seemed to obscure the global problems of climate change. Perhaps this was his version of honesty. In speaking as if the United States were aggrieved, Trump seemed to be steering his Presidency away from the future they promised as a place we never really wanted to go, as if this were in fact a way of being Presidential. The snowstorm of uncited and outdated numbers Trump presented in the Rose Garden presser seemed to offer grounds to resistance to a world treaty, without considering the implications of carbon emissions in its entire course. The defiant remarks were stubbornly opaque difficult to see as constituting anything like an actual surprise. There was no real content to his objections, and bullying arrogance substituted for a coherent argument. Perhaps since Trump has long presented himself as a great negotiator, the notion that this was not able to be remedied by the art of the deal seemed to escape him, and the role of accepting any already negotiated deal was as anathema. And to sustain this fiction, he relied on a rhetoric of disorientation by disinformation–either a natural or a studied tactic for Trump–through his juxtaposition of disproportionate and incommensurable data, in a sort of statistical litotes perhaps primarily designed to mystify and distract so much as to suggest one might actually make a populist case for rejecting the Paris Accords en masse. At the Presidential Rose Garden press conference, we were suddenly not talking about ppm or sea-level rise, but about dollars and cents and coal, but any need for accurate data on which to base one’s conclusions about climate change were brushed aside as the calculus of climate change was understood as a zero-sum game, and Trump summoned fears of the economic slowing and unemployment that the Climate Accords could cause. Did the populism lie partly in the ridiculous profusion of meaningless data and the dismissal of the data on climate change? Even if it derived from a disdain for the careful climate science conducted over years, Trump seemed to seek to wipe the decks clean of any sense that his decision to withdraw was with real environmental consequences. Open distortion of data seemed to offer the rationale, such as it exists, for Trump to reject restraints on the vision of American prosperity that he had long promised to the American electorate. Trump, more than ever contentedly at home in his own bubble, oblivious to real global climate trends, as he continued to treat the American public was the primary audience for these comments–and not the world. He acted as if pulling out of the Paris Accords in the Rose Garden was only another soundstage for a new level of Reality TV, designed at base, like his rallies, for the viewing audience, and not the rest of the world. The presser began with a warm-up band setting the tone with live upbeat slow jazz, as if to put the immediate audience at ease, and mute the crescendo of growing expectations around another episode of “Trump: The Presidency!” It is quite incredible that the media has continued to play a game of watching Trump to detect his “real” relation to climate change over the past months,–as if any beliefs were at stake in this entire affair and drawn out expectancies for declaring where we stood on climate change. The drama has seen an ongoing staking out of a surprising range of shifting positions–“Trump appears to soften stance on climate change,” “Donald Trump backflips on climate change,” “Trump admits humans have ‘some connectivity’ on climate change,” and “Trump on climate change in major U-turn,”–as if to erase any doubts about his agenda existed, we were entertained to a rehearsal of performative statements for constituents broadcast for high ratings, grabbing attention for those still seeking to read his words as tea leaves. As smooth jazz created an up-beat appearance of tranquillity that set the stage for a roll-out of withdrawal from the Paris Accords that reflected the President’s sunny disposition, it seems to have worked wonders to blanket out any concern about climate change, Trump appeared to exude confidence. Although Trump’s argument was apparently economic, any economics were tabled and replaced by rhetoric rather than reasoned argument or evidence as to where the treaty might be renegotiated–a possibility he rather magnanimously suggested, despite the non-negotiability of non-binding accords; if not, he was fine to walk away. As Trump walked circles around climate data in what seemed populist grounds for withdrawing from the Accords, he did not even dispute the criteria for even measuring climate change. Trump acted as if walking out of the Paris Accords remained Reality TV on a grand stage. He saw a purely local argument as somehow commensurate with a global problem, but almost didn’t seek to make a point so much as defend the local over the global, in a new version of America First for the global stage. The populist tone of the presser was rooted in reprising his favorite role from Reality TV by firing the performance of his predecessor, as if this were the most satisfying task at hand. For even as Trump cited mystifying juxtapositions of figures with populist indignation, he essentially repeated his delivery of the declamation he relished from The Apprentice–“You’re fired! !“–only now he got to fire the entire Obama administration for failing to represent America and feign the defense of the American economy that Obama had allegedly failed to protect. The fictional imaginary firing of Barack Obama was what it perhaps meant to gain the Presidential podium after all for Trump, who began his quest for public office most recently as an nemesis to President Obama. The talking points team Trump distributed in advanced both to congressional staffers which conservative groups would include in their reports affirmed “The Accord was negotiated poorly by the Obama Administration and signed out of desperation,” as if it were a sign of national weakness to be expected from his predecessor. rump’s real enemy was Barack Obama, after all: since “draconian financial burdens” he menacingly conjured were hard to find; then he turned his anger collectively to unnamed “obstructionist Democrats,” who he later invited to “get together with me” to renegotiate Accords which the 197 nations who co-signed had declared to be by its very nature non-negotiable. Trump’s blanket dismissal of the treaty as a “BAD DEAL”–whaddaya mean, designate $3 billion in aid for developing countries for changing to clean energy or planning reactions to future droughts, sea-level rise, and other alleged calamities?–asked America to shoulder an outsized share given its production of carbon pollution, and essentially legalize for fleecing the country in ways that Trump took it upon himself to renegotiate and right, in hopes for gaining a better deal for the country. Was Trump not constitutionally unable to declare that a deal he had not brokered could be one to which he would accede? Or might Trump, immersed as ever in an earlier time, view past practices detailed in The Global Dumping Ground described the existence of an internal trade of toxic waste, in which the 500 million tons of hazardous and toxic waste that was annually generated in the United States–tenfold the waste of any other nation–was recirculated in the global economy, and illegally deposited in foreign waters. This illegal arrangement, which Bill Moyers famously exposed “as a classic con game, a multi-million dollar scam with a toxic twist” was a poly of con men similar to Trump. It’s believable Trump regards rights to dispose of hazardous wastes, laced with toxic heavy metals dumped on third world countries as a sort of droit de seigneur, in an unavoidable consequence of the global economy. 3. The cognitive dissonance of reckoning with climate change may have run deeper for The Donald. Perhaps Trump’s deepest objections were to the voluntary contributions he described as if they would prevent allowing tax cuts for the super-rich or funding a border wall to protect our nation’s wages and wealth. There existed, somewhere within the cornucopia of data he dismissed as discredited and dishonest, an acknowledgment of the metaphorical absurdity of using concepts such as credit and debt in regards to global biocapacity or energy footprints, mocking of the use of the notion of debt to describe climate for a man who long prided himself as ‘the king of debt’ and “loving debt,” as he dismissed the idea of a sort of debt consolidation by paying for the “environmental debt” by which coal combustion in the United States created a debt for the local and federal government and health-care providers and fisheries, on tome of the costs of its extraction and combustion, hidden costs in the global economy amounting to $350 – 500 billion annually termed externalities by economists, with the externalities of oil amounting to a greater figure of $800 billion, and that the outsized consumption of energy in the United States. The nature that the United States owed poorer countries a huge environmental debt, and among other developed countries owed the undeveloped world an unrecognized debt of over 1.8 trillion, reflecting the costs at which they have developed at the expense of the poor, by Richard Norgaard’s analysis, and excluding what Norgaard termed “environmental externalities” including the ecological damage linked to their use of energy and its consumption, including greenhouse gas emissions, ozone layer depletion, agriculture, deforestation, overfishing and land conversion. It may have truly seemed ridiculous to Trump to accept that the United States was indeed a debtor nation–a proposal suggested in the maps above that must have indeed provoked a scoff from the man who had defined himself publicly as the King of Debt on the campaign trail. And if Trump glowed that “nobody debt better than me” on the campaign trail, promising to be a champion of debt reduction that he had done his best to demonize in public discourse, the notion of accepting or acknowledging a further sense of indebtedness was deeply taboo. Even if global financial markets had long unwarrantedly bet that he would not keep his campaign promises, the author of the best-selling Art of the Deal, elected by those who wanted a better deal, pronounced to the nation that the deal signed in Paris, so far from our shores, was bad for the country, and didn’t really, really have to do with the climate or environment at all. In doing so, Trump deflected any suggestion that he even understood the climate science behind it, by casting it as a potential dereliction of duty against the principles of the office he now occupies, and the commitment that he made as President to defend the American people. For populism is what Trump does best, even when it is entirely implausible to find populist reasons for denying the actuality of climate change. 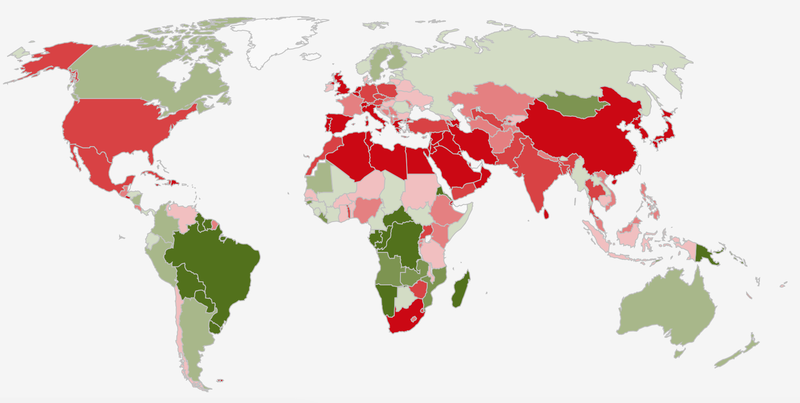 For the “deal” into which Obama’s administration was played, Trump seemed convinced, was truly disadvantageous in economic terms, inviting Americans to “think about it.” Any map showing the imbalance of the distribution of global energy consumption and pollution might have seemed, well rigged, and allowing all those light green nations to get away with murder and swindle out the scarlet red ones, first and foremost the US, in a perennially uneven playing field and working to the benefit of “other countries” and diminishing America’s economic productivity by imposing “draconian burdens” first and foremost contributing to the Green Climate Fund, which was the most explicit target about The Donald’s outsized wrath. –or as accurately representing hugely distorted discrepancies in what the impact of the ecological footprint of the United States on the global biosphere might actually be, rather than a dodge for the redistribution of wealth in the manner Europeans from Marx to Merkel have advocated so single-mindedly. And in truth, or in an alternate universe, Trump may not have stuck to them. But the Donald suddenly felt his back was pressed against the wall, and decided to pack more of a punch by delivering a tirade explaining why those who negotiated the Paris Accords were, well, fired. The thunder of his time-honored delivery however seems to have worn thin, and the enthusiastic support he has long received from those who relished hearing him deliver it seemed to have worn quite thin, especially seemed as to be referring to a drama in which they actually had some skin, after all. 4. Even as Trump attempted to invoke the evocative power of American place-names and their powers to persuade of his honesty, and the plainspoken nature of their local identity of place. For boastfully asserting he was elected to represent “Pittsburgh more than Paris,” Trump hoped to bond to middle America, but has acted less as an American President, but much more like his idea of one, and even more like an old man, his powers as a magician waning and starting to fail. For if he hoped to evoke the literary power of a self-image of America distilled to place-names of a “true” America, in claiming to be “elected to represent the citizens of Pittsburgh, [and] not Paris,” Trump’s remarks provoked the scornful tweet from Pittsburgh’s Democratic Mayor Bill Peduto, himself a member of and a member of Climate Mayors. Pittsburgh provided the sort of position of authenticity of the outsider Trump so loves to cultivate, Peduto responded by disabusing him of the image of Pittsburgh past, asserting Pittsburgh would now follow Paris–and had voted in a landslide for Clinton, anyway–revealed the sham of claiming to represent America against the world by standing with the common man. Peduto even penned public op-ed with the Mayor of Paris to suggest just their common grounds. And Peduto’s rejoinder may have helped to decisively reject Trump’s geographic imaginary, and his puffed up pretense of allegiance to preserving America’s Rust Belt–and suggested the President better consider Pittsburgh as being more like the Paris of Appalachia. But the alliteration was hard to pass up, even if it was a deeply deceptive ploy to emphasize his newfound Appalachian roots. And as members both in a Global Covenant of Mayors for Climate and Energy, which currently includes over 7,400 cities, making common cause in front of Trump’s unilateral withdrawal, as well as cities in a striking preponderance of the states in the union. But Trump claimed allegiance to the notion of a place-name that long symbolized the Rust Belt as if it provided him with leverage to tilt aggressively against Europe, without any sense of global impact or of his global audience, and against the Europeans of which Paris became the synecdoche, but hopes to champion local roots the would Trump global consensus. Trump was undoubtedly smarting from his meetings in Europe, and probably eager to reject claims after he suffered Europeans to lecture him endlessly in Taormina,–and which, even if he didn’t get their points, simply all the more galling as he’d been elected President on a platform of tearing the treaty to shreds. Upon his return from Taormina, Trump must have been energized to fight back, as if boosted by the rejection of appreciating others’ needs. In conjuring the specter of disempowerment, as if the treaty proscribed a feminization of America he vowed never to be allowed to come to pass, Trump offers the manly proclamation “America will withdraw,” as if withdrawal were a truly courageous and patriotic act. From his bully pulpit, he conjured collective disgruntlement “from the Paris Climate Accords,” described now as foisted upon his newfound fraternity with coal miner friends, before whom he recently pledged to roll back federal environmental regulations his predecessor had imposed. But do 50,000 jobs in coal-mining industries, even if they map on to victory margins of 63% in Kentucky and 70% in West Virginia, overwhelming victories in once democratic strongholds won as coal miners embraced his candidacy, justify scrapping the Accords? The low number of jobs in the business of coal extraction–50,000–raised immediate questions of what sort of exactly how “punitive” the Accords are for the United States, or what sort of prominence Trump imagines the coal industry as having in the scenario of energy production in the nation’s future. 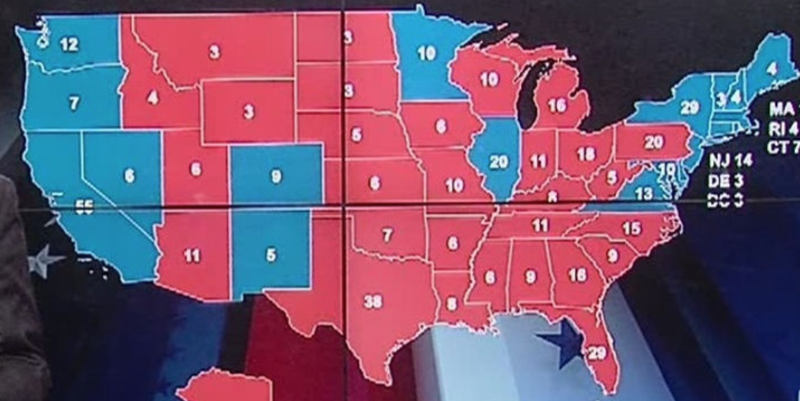 Part of the problem might have been that Trump was looking at the electoral map. 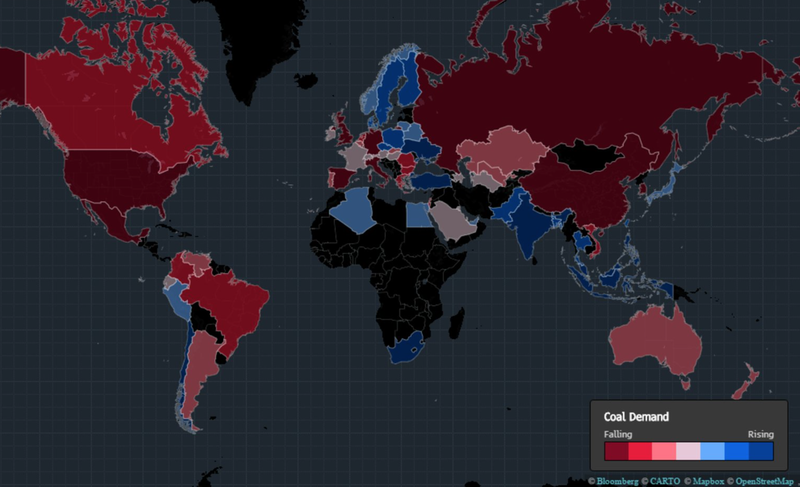 Rejecting the Paris Accords provided an effective public avenue for branding that echoed the branding the conceit of the “War on Coal” as a Democratic policy,–a conceit that had roots going back to 2014, and before Obama lost the state in 2012, despite the Democratic over-registration of the region and despite overwhelming reliance of many in West Virginia and Appalachia on receiving federal aid. How else but by branding can one hope to cast the federal government from which so many counties benefit as undercutting the limitations of their local economies? 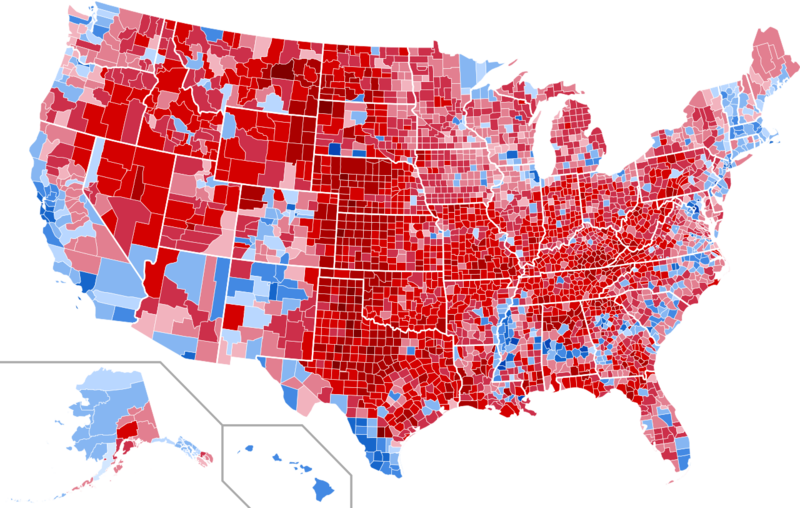 To be sure, 366 Appalachian counties increasingly voted for Republican Presidential candidates from 2004 to 2008, buoyed by the fiction of the War on Coal that generated a groundswell of support for Republicans Trump took care to reaffirm; all of West Virginia’s counties rejected Obama in 2012, and Trump overwhelming defeated Clinton in Appalachia, with the exception of Pittsburgh and a few redoubts. –can opposition to Obama provide the groundswell of national support for the disadvantageous nature of the Paris Climate Accords? The sort of populism that Trump seemed to seek to summon seemed to lie out of reach, even if Trump has made it a habit to continue to surprise and defy what seem rational expectations. 5. The local is not only a distortion of the global. There is increasing hope that over 1200 states, cities, universities and tech companies made common cause of dissent, quite reactively entitled “We Are Still In,” to affirm their commitment to reducing carbon emissions “in the absence of leadership from Washington,” as they wrote forcefully in an open letter to the world. The group launched by mayors of Los Angeles, Houston and Philadelphia that grew to over 247 mayors of some of the largest American cities have pledged to “honor and uphold” the Paris Agreement, providing national leadership to circumvent the absence of resolution in the executive branch. In rebuke to Trump’s outright refusal, We Are Still In affirmed the force of the goals of the Paris Accords: mayors, attorneys general, businesses and cities rejected the President’s call for isolationism by voicing commitments to renewables across the country in thirty-four states spanning states “red” and “blue” rejected the recalcitrant rhetoric of the Rose Garden speech, in a broadly based level of local resistance against misguided executive action and its rhetoric of deception, to leave Trump’s voice smaller and more isolated than ever. The commitment to adhere to reduce carbon emissions retained the targets at the heart of the Paris Accords. They went to the heart of Trump’s imagined historical role, although what that historical role was was always unclear. 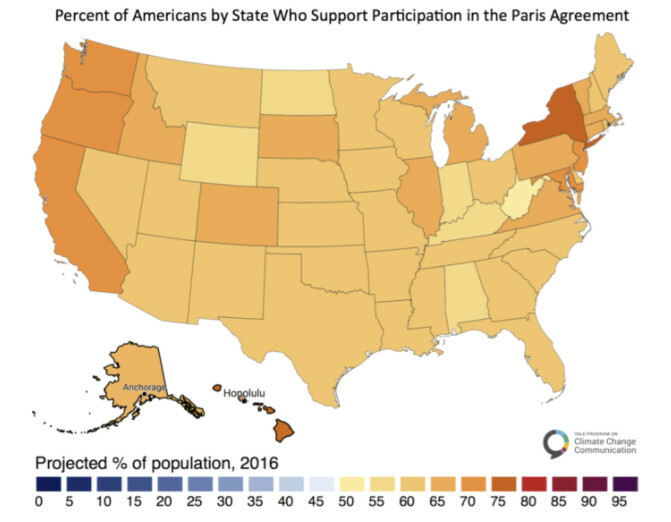 Even if America contributed only 20% of pledged emission reductions in the Paris Accords. Though the regions that constituted over a third–35.9%—of the U.S. population and contributed 30.6% of U.S. GDP in 2016 were not from the areas that created the greatest emissions, the group of states that expanded far beyond the conventions shared by governors in the core states of California, New York and Washington, to which seven other states have joined, has expanded in something like a climate rebellion across the country, as increasing states have supported the emission standards of the Paris Accords as a basis to affirm local commitment to emissions controls in hopes to reorient national discussion about climate change on more solid grounds, in ways that constitute a quite new narrative and message about place, and the relation of place to the global economy. –and the increased commitment of many of the same cities to a future of renewable energy, and indeed to put their grids on renewable energy by 2035, as Portland, OR, San Francisco, San Diego, Burlington, VT, or Salt Lake City, to transition to renewable energies for electricity, or of all state-owned buildings, as Chicago did by 2025. Rather than regions depending on coal, cities are committing to renewables by providing a structure for the commitment to the Paris Accords to advance, long before Trump decided to pull the nation out. 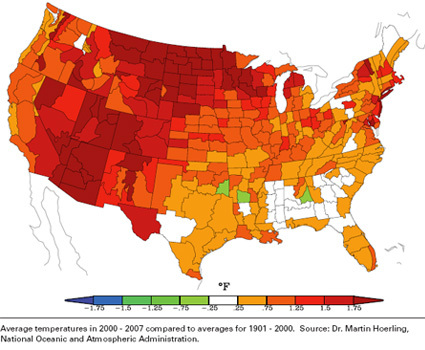 To be sure, Trump’s re-orientation suggests a difficulty of possessing less deeper local familiarity with data on climate change of which Trump most often seemed oblivious, perhaps as he was so unfamiliar with the rising levels of temperature that had made the American west a region where the rise in temperatures had been almost double that of the rest of the world. It obscured the relevant maps of global carbon footprints, moreover, which suggest the huge role of carbon emissions in the United States and their role in climate change, and the importance of joining a global concordat to reduce emissions with other developing nations. “America First” or not, however, Trump’s biggest objection seems the Green Climate Fund, or what he understands it to be. For he painted this Fund as imposed by the United Nations, as central among the theme of onerous obligations the Paris Treaty created, obliging the U.S. to commit to “potentially tens of billions of dollars,” as if this were an onerous obligation created by a non-state actor of animosity to the nation, which might extract billions of dollars from the nation’s wealth, rather than affirming a voluntary agreement to adopt best practices for the world’s environment. The so-called President disdained the Green Climate Fund itself, which became, in Trumpist rhetoric, as but a scam of clever re-branding, by so disdainfully describing the “so-called ‘green climate fund’ — nice name! — which calls for developed countries to send $100 billion to developing countries“–though the figure he pulled out of thin air had little to do with a bill presented to America, but the amount pledged to developing countries, of which already $1 billion has been already paid. The result seems intentional disorientation. While calling the deal’s deep “unfairness” that it “tied [America] down,” “costing the country a vast fortune” better spent on a Border Wall even if only a pittance of last year’s $3.9 trillion budget. 6. Gripped by the intensity of his own rhetoric and a dogged if not delusional determination part Ahab and part Don Quixote, with deeply misguided sense of his place in world history but out of touch with the world in his own tortured way, the so-called President tilted against the threat of the imposition of the feared obligations of collective action on climate change as restraints targeting America from overseas. He pursued the need to push back against Climate Accords that he wanted rolled back at all cost,–perhaps in part since doing so seemed easy to play as restoring the centrality of all things American to the center of the world, as if the very notion of shared responsibility (if not globalization itself) were but ruses that his predecessor had perpetrated on an unwilling nation. If there was a logic here, it was the doggedly pursued fiction that the world was eager to rip off the United States–an “us against them” mentality that seemed to justify a retreat into isolationism. The mindset might be deeply rooted in an animosity that, the Daily News registered on June 2, seemed to play himself against the world, but to diminish the extent of the global warming that 197 nations signed on to the Paris Accords with hopes to address. Indeed, Trump may probably have liked the front-page attention that the speech won him the Daily News, which reprised the tabloid’s 1975 coverage of President Ford’s vow to veto any federal bail-out of New York City, recasting it as a similarly selfish blanket rejection of the demands of the entire world. Rather than citing the band Coldplay, Trump was here evoking the notion of globalization as chaos, and fears of an impending apocalypse that needed urgently to be held at bay–but an apocalypse that was something other than climate change. The slogan straight out of Trump’s populist playbook, and was first adopted when he had his back against the wall in October of 2016, a month before the Presidential election, when he accused Clinton of starting “birtherism,” castigated her “horrible treatment of women,” and went into “full Breitbart” mode with the above ad. (Is it only a coincidence that the rejection of the Paris Accords was championed by Steven Bannon?) But Trump seems to have been so ready to have the nation watching him with suspense to have been reluctant to debrief diplomatic corps who would have to explain the action, lest their be a leakage for the faux surprise of the statement. For lack of framework to roll out the decision that was really of world-changing consequences, however, the world was taken by surprise. –but the focus purely on domestic priorities on an issue that is more global than any he has probably ever considered is tragic to be seen through the lens of the domestic economy. Trump claimed to be place American interests ahead of any pretense for acting in defense or recognition of the entire rest of the world, who, he seemed sure, only had it out for the fortune America had inherited. In Trump’s speech, ostensibly about the world’s economy, the local trumped the universal, the gut trumped the brain, and antipathy to government regulation trumped common sense, it seemed, as the Donald slammed the conclusions of power elites and pointy headed academics collectively, and offered only false data to back it up–and did so quite deceptively. And then went to play golf, as if to retreat back in his own bubble again, perhaps to regain composure after clutching at the partial figures that seemed to lie scattered in his mind. The truth is, between the tidbits of data, Trump kept someone guessing what his position was, as if in order to curry expectations for this press conference for some time, as if it would be a moment of truth. Trump’s readiness to provide bad data as the basis for his argument is, of course, all the more pointed in a tirade against “discredited data,” as if it is a term that all Americans have every right to be suspicious, if it is true that Trump’s steadfast advisors took advantage of showing him bad data after all–or “presenting facts and figures,” as is Trump’s preference, that Kellyanne Conway assured us were “really important” in presenting an “evidentiary case”–as if this was a subject where evidence was not really considered before, even if much of it was “scientifically dubious, misleading, or out of date” and the authors of the major study the President cited were the first to distance themselves from his argument. Kellyanne’s odd assertion that Trump “started with a conclusion, and the evidence brought him to the same conclusion” is, at any rate, not exactly a scientific model. He certainly didn’t get the nature of the Accord in claiming that its goal was in fact only to reduce climate temperature by the “tiny, tiny amount” of two-tenths of one degree by 2100–a classic example of Trump mystifying audiences by combining two figures of radically and dramatically different scale, to suggest their absurdity and unmoor his listeners–but of using data to dramatic effect (why wait so long for a meaningless reduction, if those impositions are truly”draconian”? ), by which even his supporters are asked to follow him down a rabbit hole and say farewell to reason. 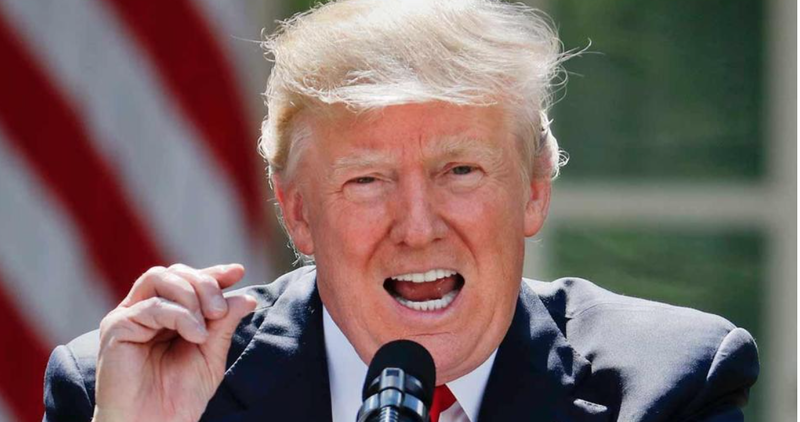 “Think of that–this much,” Trump announced, imploring Americans not to be duped into a deal of such proportional injustice without any sense of what the science was. Scorn for such “a tiny., tiny amount” seemed to upend generations of data on climate monitoring, in a masterful stroke of disinformation. 7. If Trump made an argument from data–or from the credibility of “deceptive data,” the fact is that he didn’t seem to care what the data was, save as part of the narrative he sought to create and the theatrical claims he sought to make. Entering into an agreement that he argued would cost “up to” 2.7 million lost jobs by 2025–“Believe me. This is not what we need”–rested not on any sources, but on affirming a previously staked position, and come largely from the papers of climate change deniers, or pro-business groups as the American Council for Capital Formation–that exclude the issue of climate change from the debate, and remove it from the table. By shifting the argument to taxes, jobs, regulations, and worst-case scenarios, Trump seems hopeful of gas disorienting the nation by not looking at those bothersome visualizations of rising oceans and climate change. The broad claim Trump made, with almost no basis, that environmental relations tied to preventing climate change would generate an extra $30 billion in wages across America over the next seven years and “greatly help American workers” was produced for a fossil fuel industry nonprofit years ago, and was made with limited analysis or peer review, hypothesized the opening up of all federally protected lands for speculation in oil, gas, and mining–and reducing this to a datum that, while possibly persuasive to some in isolation, typifies the selective use of citation and removal of data from context, a deep mischaracterization tantamount to cherry-picking of unripe fruit, but basically seeing data as a form of branding, and disrespecting the work data represents or even the status as data as data that can be meaningfully read. All this might suggest the role that cartographers might have in the onslaught of disorientation that informs Trump’s public speeches and frames his decisions, as if to seek to warp our collective maps. Maps of course embody data, and the function of making maps provide something like an effective counterweight to the confusion of continuous selective citation of deceptive data and pseudo-science. For the disorientation provoked by streams of unverified data is enough to destabilize the maps by which we orient ourselves to the world. 8. Through the entire numbing Presidential campaign and now into his presidency, Trump has long promoted on his Twitter megaphone to trumpet alternative facts, to the dismay and open scorn of climate scientists who view them as massaged disinformation in which Trump openly indulges to promote an agenda and close open inquiry. The onslaught of a streaming citation of facts without scruple to their authority or provenance upsets the mind of the reader as if in a crude brainwashing, substituting tribalism from inquiry, and altering data in order to promote individual interests, but communicating a lack of understanding of broader collective trends–inveighing against deceptions, and concealed interests, while championing personal opinion and skepticism. Indeed, in the midst of the “avalanche of untruths” launched throughout Trump’s candidacy the dislodged data that he has used to create or materialize a sense of disorder and generate panic argued to create a sense of his rhetorical ability to create an alternate reality. And bad data is perhaps the worst and most insidious fake news, or at least the most unstable sort, as it is able to serve entirely unsubstantiated arguments and to give them the sheen of normalcy. Deleting every mention of global warming and climate change from government websites was an early one of the early post-inaugural actions of the Trump administration–the data was webpage on climate change was erased or purged from the website of the Executive Branch even less than an hour after Trump took the oath of office, as if the Trump administration had prioritized to expunge climate data from the EPA website to distance the US government from endorsing its occurrence. The open attempt to erase detailed data on carbon emissions, as well as scientific research on global warming and climate change, suggested a sort of disinformation, and even more a diversion of attention from a pressing issue. The result was to limit understanding of climate change. 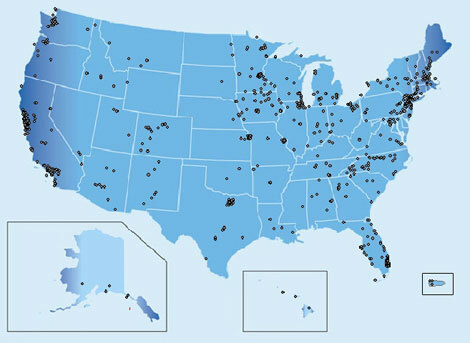 In hopes to archive and preserve data, enter NOAA web pages were copied and sent to the Internet Archive before the inauguration, and the zoomable interactive maps of greenhouse gas emissions that were allowed viewers to locate emissions levels at the level of high-emitting factories and power plants to the EPA’s entire library of local air monitoring results from the last four years. Such downloaded datasets were able to be migrated before being destroyed, often through back doors to be preserved in newly uploaded form on alternative shadow repositories like DataRefuge.org, even if it might lack the coherence and architecture of the websites developed at the EPA that would allow public outreach and open access. While climate change data exists in a form that has migrated to a National Archives website, the omission or erasure of data prepared the way for Trump to withdraw from the Paris Accords, although at the time of his inauguration–just six months ago–this was deemed to be require years for the United States to leave. The fears that the Trump administration is eager to delete decades worth of information has lain in the moves of the Trump administration to scrub entire datasets on open.whitehouse.gov created under the Obama administration to make them less accessible to the public–under the pretense of cost-cutting–and doing so surreptitiously, as well as disrupting links to tools that had been stored in the National Archives and Records Administration–as well as reducing budgets to make it impossible to collect such data. 9. Trump’s rhetorical orientation of his audience’s attention to Pittsburgh or his celebration of the perspective of coal miners in Appalachia is a similar privileging of a place to create a sort of rebranding, as if designed to erase the actual problem of global warming by making America provincial again, as if that were to make it great. The substitution and introduction of poor data–or bad data–is very bad news for the county. The decision led climate scientists to rush to compile and repost links to government web pages and data sets that they had downloaded to before Trump’s inauguration—focussing on the websites of the Environmental Protection Agency and National Oceanic and Atmospheric Administration—in hopes to archive information which might be erased. Of course, maps might better allow one to visualize trends, as of sea-level rise, and offer tools better to imagine one’s actual place within future projections, rather than dislodging data from any narrative about place. Or, in a more “extreme scenario,” able to occur by 2100, the coverage of much of the south of Florida in Climate Central’s projection for sea-level rise by the end of the century would suggest the radical redrawing of the coastline of the country, and indeed of all countries in the world–and the radical manner in which property rates in much of the coastal United States would be radically redrawn, with much of the Florida coast from Boca Raton to Ft. Lauderdale to Hollywood to Miami submerged by the century’s close, as well as the entire Everglades reserve. The notion of such a coming global inundation as the result of a massive polar ice melt may be visualized as a potential redrawing of coastal regions of the world as something perhaps not too far off,–in ways that might compel us to understand emission levels as remapping the inhabited world, by giving dramatic concreteness to rendering the ramifications of a failure for collective action, and helping to visualize the danger of a rise of climate temperature we would not be able to slow. 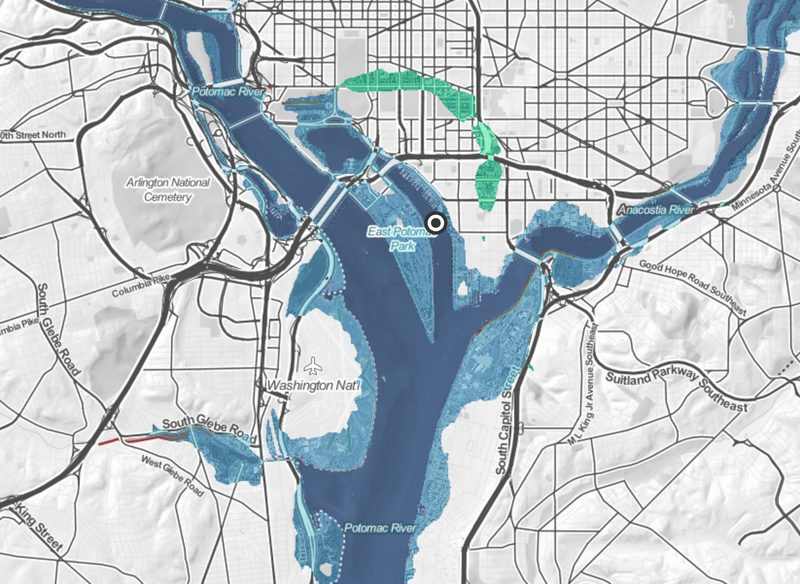 –in ways that suggest a monitory cartography depicting sea-level rise. How is Trump so darned misinformed? Is it a strategy of snowing over the nation, a form of gas lighting, or actual ignorance? The alarming habits of Trump’s selective consumption of news curated by unidentified members of his staff suggests the way that internet hoaxes have been entered into the range of tables, figures, and charts assembled for his perusal, without much vetting or support, as well as even migrating from Twitter: Jared Kushner and Ivanka Trump are argued to have slipped reports to the President in his private quarters earlier in the game, but the discussion from one staff member that “they have this system in place to get things on his desk now,” in which Trump is presented a binder of clippings from his communication team, as well as depending on using their access to the president in ways that have yet to be fully described, may account for the unmoored and unreviewed datasets Trump on which so copiously cites with abandon, and which he appears to rely, often to the surprise of his staff–who seem regularly forced to ferret out their original citation. For, in addition to his consumption of cable news and print newspapers, the passing of such papers in informal information flows–which Trump may also request from his source, of course, on specific topics–suggest the deeply selective nature of Trump’s relation to data, and his tendency to fixate on disembodied numbers, in ways that demand to be mapped.